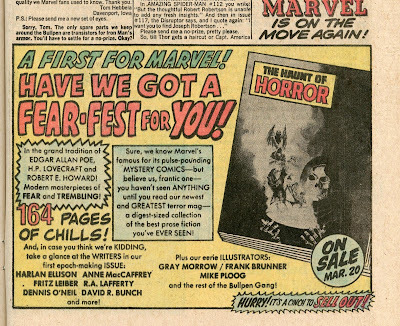 As a child of the Marvel Age and the Silver Age of Comics the last few years have been difficult as we have lost so many of the people we so admired. 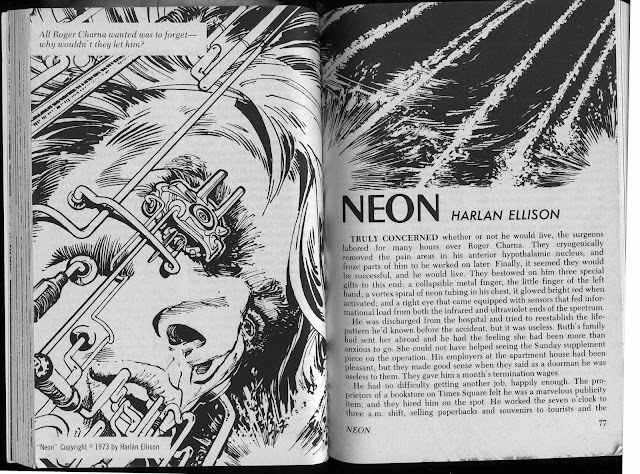 We have just lost Harlan Ellison, the writer on the edge of forever, on June 27, 2018. His association with Marvel during the Marvel Age produced some unforgettable stories. Now is a good time to share them. In 1971 Harlan wrote an outline for a two part Avengers/Hulk tale. 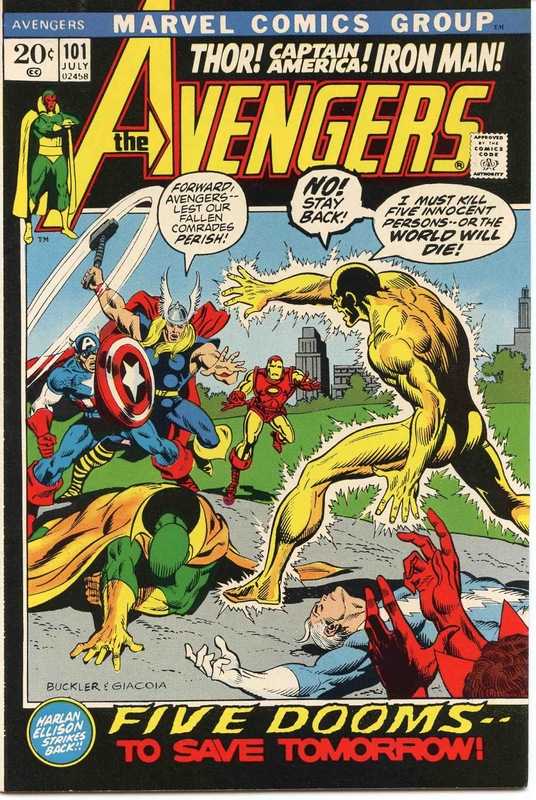 The story appeared in Avengers #88 and was continued Incredible Hulk #140. 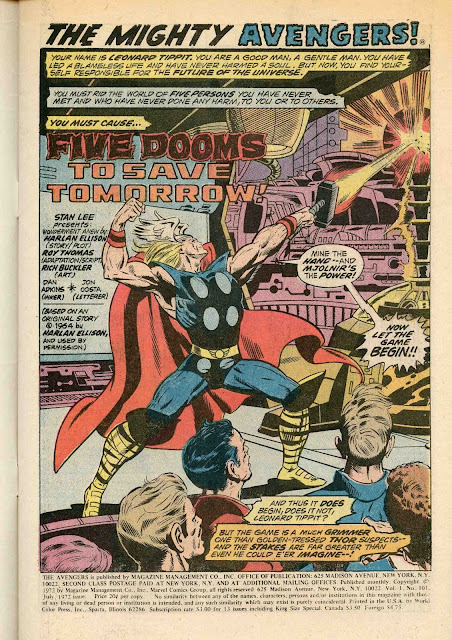 His outline for this tale was published in Marvelmania #4. Here is the complete outline of that story. SPLASH PANEL shows the Hulk caught between the poles of a specially-rigged trap powered by the magneto generators of Boulder Dam. He is being bombarded by millions of volts of electricity. 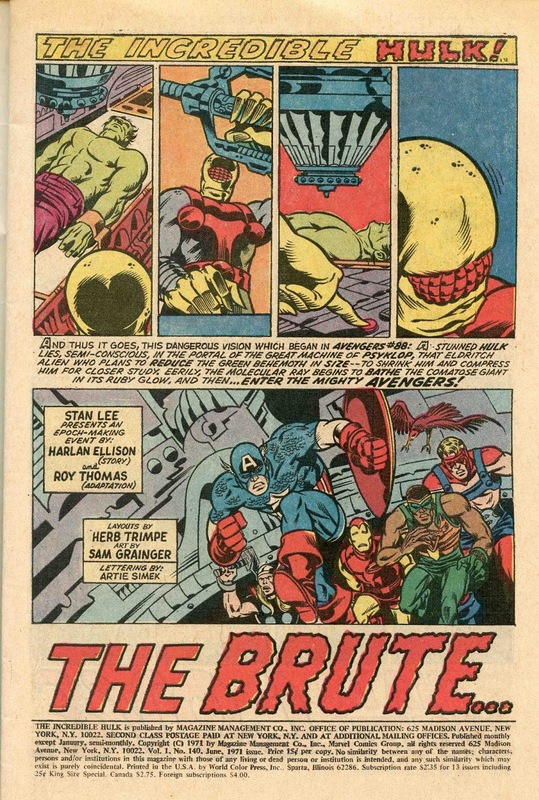 Thunderbolt Ross and his corps of army engineers have lured the green behemoth to the dam where they have pinned him in a barrage of current--[much in the manner the Thing was killed], in hopes the assault—enough to slaughter an army of rampaging Visigoths—will stun him long enough to put him in a newly-designed crypt filled with coma gas. 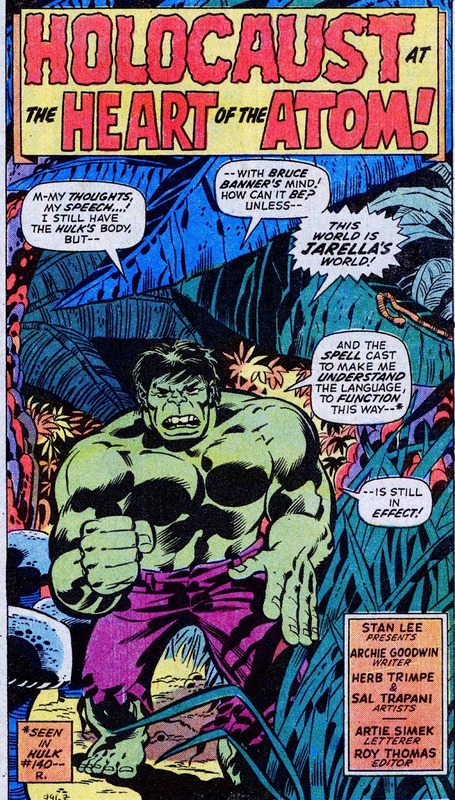 Then, effectively immobilized, the Hulk will be transported to a testing ground where he will be kept unconscious until a cure has been effected to turn him back, once and for all, to Bruce Banner. The crypt was designed by Tony Stark and Reed Richards, working in conjunction with Professor Xavier. The Hulk, pinned in a torrent of lightning. As the electricity takes its toll and the Hulk sinks down senseless, the great crane-machines move in, to lift him into the coma crypt. But as they lumber forward, as they wait for the instant the electricity ceases its crackling work, the Hulk suddenly becomes transparent, wavers in their sight, and... vanishes. Winks out of existence. Cut to the underground eyrie of a bizarre new villain, Syklop; half-human, half-creature of a long-dead race, he is the menace being even now stalked by The Avengers. And as we first see him, first dwell on the eldritch horror of his single bee-faceted ruby eye, his strangely structured body, we see the Hulk suddenly appears in the crystal receiving portal of a weird machine. Syklop runs through his background and his purpose at this meaningful moment like a damned soul telling its beads for the final, agonizing time: his race had lived in the bowels of the Earth eons before even apes had walked the land. But they had fallen into disrepute with the dark gods they had worshipped, and they had been put to eternal sleep. For millennia they had dwelled in that starless night of empty dreams; until Syklop had been called up from slumber by the dark gods, who had promised him if he could tap a new source of power for their failing energy demands, they would release his race—who would then with ease recapture the world for themselves. And so, with the aid of ancient sciences and regimens even the most advanced human scientists would call sorcery, Syklop has located a source of power, limitless power, that if he can only tap, he can save his race from eternal sleep and certain destruction. That power source: The Hulk. Now, with the Hulk stunned, lying semi-conscious in the portal of the great machine he has used to disassemble the green giant’s atoms and reassemble them here...Syklop knows his theory was correct: the only way to uncover the secret of the Hulk’s incredible power is to compress the atoms of that green form so the molecular structure can be better studied under the analyzers of another of Syklop’s herculean machines. But to do this, the Hulk must be reduced in size and must be shrunk and compressed. 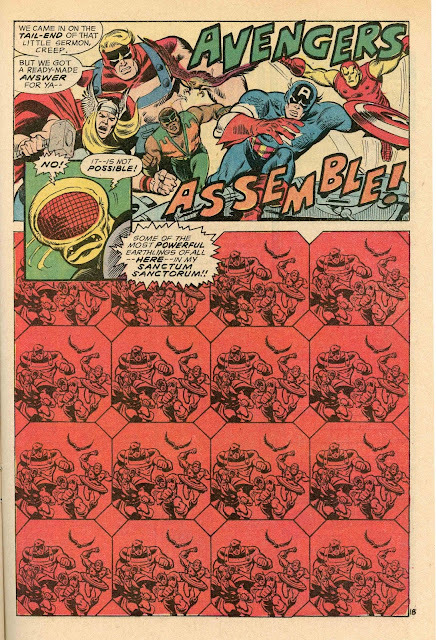 He transfers the Hulk to the other machine, and the shrinking ray begins to bathe green behemoth in a ruby glow. Syklop knows he must be careful, and not shrink the creature too much. Cut back to Syklop’s subterranean laboratory, where the horror representative of that sleeping race of monsters manages to reach the machine used to assemble and disassemble atoms. He turns the ray on The Avengers and they blink out of existence-appearing suddenly... with their memories wiped clean of anything even remotely connected to Syklop...on the downtown express platform of the IRT 7th Avenue Subway... turning and looking and confused at how they got there as...Syklop dashes to close off the shrinking ray. Now he is dwarfed by the feather-topped trees, he is smaller than the diamond rocks striated with onyx, he is tinier than the lumbering, lupine beast snuffling at him through the underbrush. But he is still the Hulk. And as the saber-fanged wild wolf-thing spies him and leaps at him, the Hulk grabs at one of the protruding razor-sharp teeth, rips it loose from the creature’s mouth, and impales the wolf-thing through the throat on its own tooth. He hears the shrieks of people in terror and gives one mighty leap that carries him above the waving feather-fronds of the trees. Casting about in mid-leap, he sees a city of pink and blue stone, and from that city comes the massed sound of a populace under siege. He hurls himself through the air and lands with a crash just outside the gates of the magical little city, where he sees a rabid pack of saber-toothed wolves like the one he has just slain, attacking the walls. And he sees that the people, who are small and green and quite beautiful are ill equipped to stave them off. He identifies with them: they are his size, they are his color, and he has no love for the wolves. He wades into the beasts, using his behemoth power to scatter them and frighten them. He grabs two of them by their tails and ties the tails together; then, using the wolves as a Gaucho would use a bola, he spins them overhead, around and around, finally hurling them far off across the horizon. One after another he crushes the wolves, hitting one so hard he drives him deep into the ground. Finally, when they are dispersed, the gates of the city open and the people stream out. They seem, at first, to be attacking (to the dim brain of the Hulk), but they are so lovely, so friendly, he holds his blows for a moment and they lift him to their shoulders, carry him into the city, and there they make the Hulk their king! The queen, Jarella, is obviously taken with the Hulk and she orders the Pantheon of Sorcerers to devise a way by which the Hulk can learn their language. Torla, the head sorcerer, a kind of Merlin-like man, works a spell (that in this universe is science, not magic) that not only gives the Hulk the gift of speech as they speak it, but somehow clears the befogged brain of the behemoth, and for the first time in many months he can think rationally, not as the rampaging killer he has been. The Hulk calls the court in session and confronts Visis with the charges, and the assassin turns evidence against his master. Everyone expects the Hulk to kill Visis right there in the throne room. But this is a new Hulk, one whose mind has been cleared by Torla’s magic/science. And he merely orders Visis to gather his goods and his supporters and leave. He is banished. An enormous shadow falls across the glass dome of thr throne room. Then a monstrous hand crashes through the glass and huge fingers grab the Hulk in an unbreakable grip. He is lifted up, out of the castle, into the sky. In the grip of Syklop! As Jarella and Torla and his subjects watch in horror, King Hulk is lifted away and up and up and up. Then, in the clutch of that ghastly eldritch creature who stands like a mountain above their land, they see Syklop laugh his terrifying laugh of triumph and... They both grow so enormous they vanish from the sub-molecular universe. Jarella is bereft of her love, and the people have lost their king. But what of the Hulk? 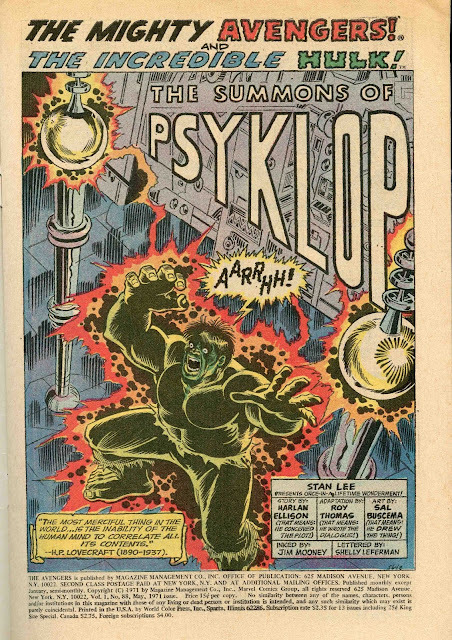 He reappears in Syklop’s laboratory, but before the monster can sedate the Hulk, the effects of Torla’s sorcery wear off, and the Hulk goes on a rampage, demolishing the lab. Then, before Syklop can stop him, he batters his way through the very walls of the underground lab, through the earth, and leaps into the sky. Syklop’s equipment in ruined. He must start over again, if he can. But even before he can contemplate such an alternative, one of the Dark Gods appears to him, even more terrifying in its shadowy outlines than Syklop himself. And the Dark God intones, “You have failed”! For the first time in his existence, the Hulk is happy. He seems at home! These green people love him, want him, need him as their King. And for the first time a beautiful woman loves him, not Bruce Banner but him, the Hulk. Only Visis, the pretender to the throne, hates him, and plots to have him killed. One night the men of Visis descend on the Hulk as he sits staring out at the multi-colored star sky of this nameless little world in a dust mote. He is attacked but easily manages to drive them off, in the process grabbing one of the assassins who tells him it is Visis behind the plot. The Hulk calls the court in session and confronts Visis with the charges, and the assassin turns evidence against his master. Everyone expects the Hulk to kill Visis right there in the throne room. But this is a new Hulk, one whose mind has been cleared by Torla’s magic/science. And he merely orders Visis to gather his goods and his supporters and leave. He is banished. The Queen and the court cheer the Hulk for his humanity, and they declare they want him to stay with them forever. 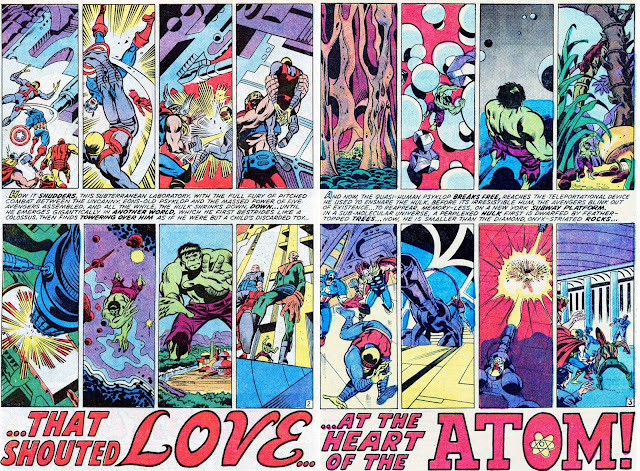 The Hulk’s heart is full, for the first time he knows love and joy and... An enormous shadow falls across the glass dome of the throne room. 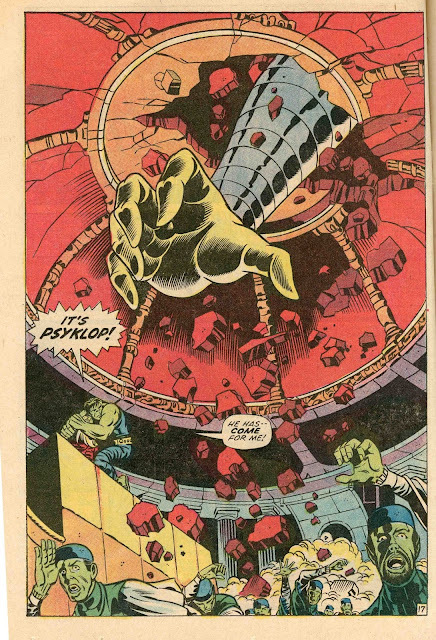 Then a monstrous hand crashes through the glass and huge fingers grab the Hulk in an unbreakable grip. He is lifted up, out of the castle, into the sky. In the grip of Syklop! Syklop’s screams as the Dark God takes his revenge And what of the Hulk? Leaping through the sky, a dim memory of happiness still fading from his fogged brain, he remembers a tiny green Queen and a time of joy. And he soars away into the distance, trying to find a place he can never find again, not even understanding that the world and the life he seeks are forever denied him, locked in a mote of dust clinging to his garments. Once again he is the homeless, brutal Hulk. 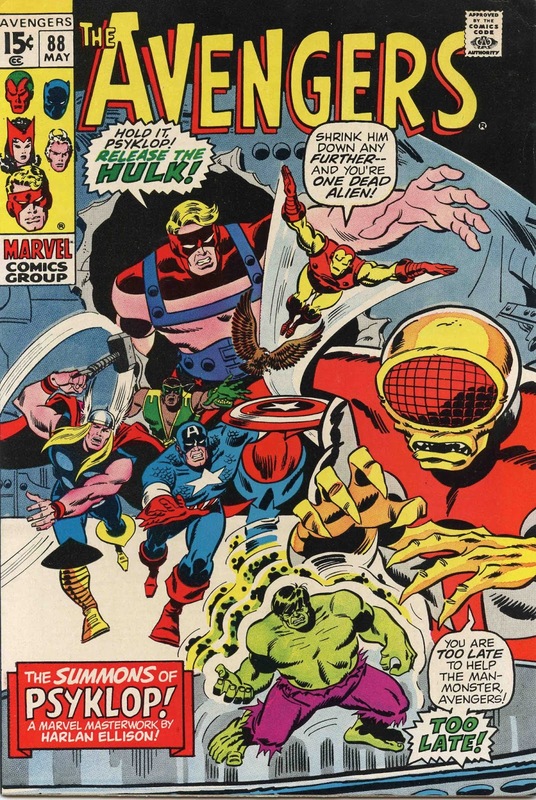 Harlan was to contribute to the Avengers again, in issue #101, 1972. The story begins with a chess match and the plot unfolds like one. One man becomes the focal point of all history and he inadvertently threatens the world. 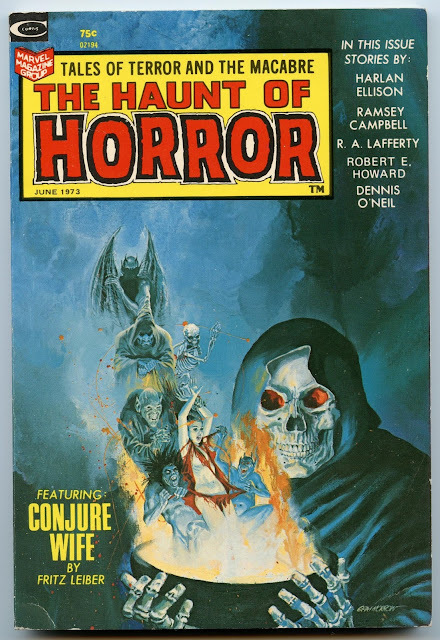 Leonard Tippit is given super-human powers by the Watcher to kill five people who would have been the parents of the children that will cause the end of life on Earth. The Avengers battle him and they are aided by the overseeing Watcher. In 1973 Marvel published two issues of a digest magazines under the title, Haunt of Horror. Harlan had a story entitled Nova published. The artwork is by Walt Simonson. OOPS! 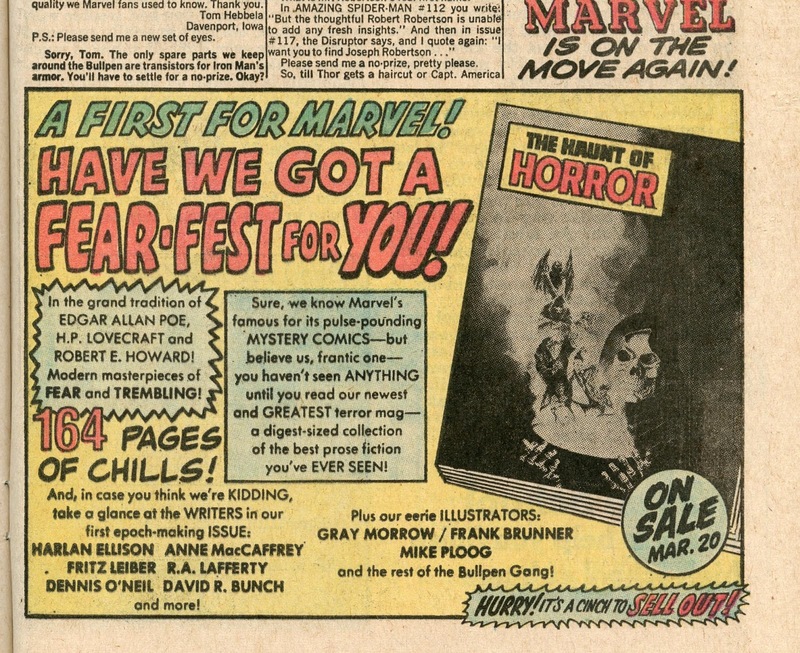 Marvel misprinted the last two pages and had to reprint them in the next issue, correctly! 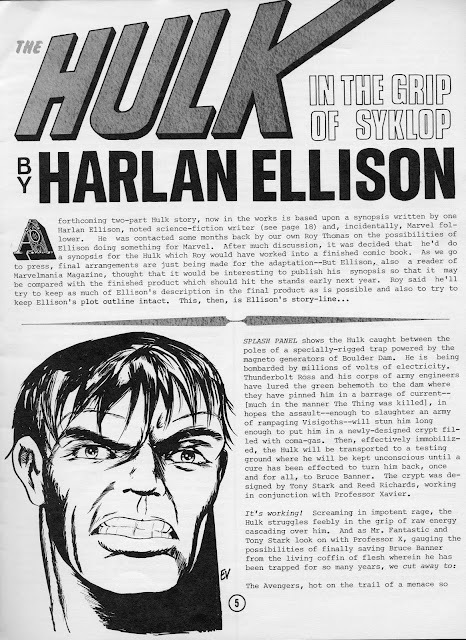 Harlan's characters were not forgotten and were used in some of the best Hulk stories of that era. 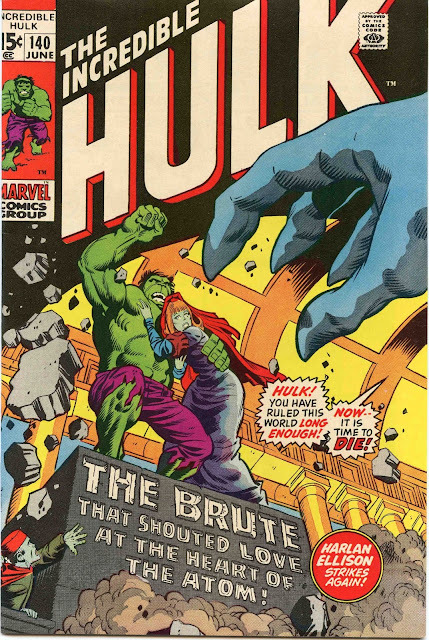 Here is the splash to Incredible Hulk #172. THe Ditko part is so spot on. Sigh... so long Steve.